The Court's decision in U.S. v. Lopez (1995) marked the first time in more than 50 years that the Court limited Congress's commerce power. In United States v. Lopez (1995), the Supreme Court ruled that Congress had exceeded its constitutional authority under the Commerce Clause when it passed a law prohibiting gun possession in local school zones. The case arose out of the Gun-Free School Zones Act of 1990, which made it a federal offense "for any individual knowingly to possess a firearm at a place that the individual knows, or has reasonable cause to believe, is a school zone." Alfonso Lopez Jr., a high school senior, was convicted in a federal district court for knowingly possessing a concealed handgun and bullets at his San Antonio high school. The Fifth Circuit Court of Appeals reversed the decision, ruling that the law was beyond the reach of Congress's power under the Commerce Clause. The government appealed to the Supreme Court, which reviewed the case in 1994. 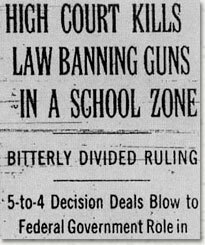 The Supreme Court, in a 5-4 decision written by Chief Justice William Rehnquist and released in 1995, ruled that the Gun-Free School Zones Act was unconstitutional and overturned Lopez's conviction. The Court ruled that the act exceeded the limited powers of Congress under the Constitution, rejecting the government's argument that the act was constitutional because the buying and selling of guns and associated illicit activities affect "interstate commerce," which Congress may regulate under the Commerce Clause. The government claimed that gun violence in schools leads to both more dangerous and thus less commercially healthy neighborhoods and less economically productive kids. The Court responded that regulating guns in local schools is not sufficiently related to Congress's Commerce Clause power to pass constitutional muster. The Court maintained that Congress could constitutionally regulate three things under the Commerce Clause: instrumentalities of commerce, the use or channels of commerce, and activities that substantially affect interstate commerce. This act could only be seriously justified under the third category, but even there it ultimately fails because the regulation of guns in school does not "substantially affect interstate commerce." First, the act contains no provisions stating that the unlawful possession must somehow be related to interstate commerce. Second, Congress presented no hard evidence showing such a substantial relation, but only "theories" positing "tenuous" links between violence in schools and injuries to the national economy. Accordingly, Congress had overstepped its limited Commerce Clause powers and instead usurped the state's typical role in policing these crimes. Since 1937 and until United States v. Lopez, the Supreme Court had consistently upheld, and greatly expanded, Congress's powers under the Commerce Clause. Before the New Deal, the Supreme Court interpreted the clause literally and narrowly, ruling in United States v. E. C. Knight (1895) and Schechter Poultry v. United States (1935), for example, that the Commerce Clause only permits federal regulation of the buying, selling, and transportation of goods between states, not over the manufacture of goods within states, even if that manufacture was closely related to interstate commerce. Yet in the late 1930s the Supreme Court greatly changed course, ruling that federal laws regulating the local production of goods "substantially affected" interstate commerce and was therefore constitutional. By the 1960s and 1970s, in fact, the Court ruled that laws banning segregation in roadside motels and restaurants and outlawing local practices of loan sharking "substantially affected" interstate commerce and were constitutional. Lopez thus marked the first time in more than 50 years that the Court limited Congress's ever-growing commerce power. Although not returning the Court to its pre-1937 posture on the scope of the commerce power, the Rehnquist Court's decision in Lopez and the cases that followed it may be the harbinger of a developing constitutional revolution in federalism.